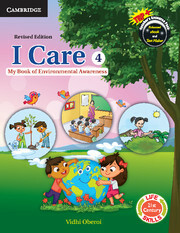 I Care: My Book of Environmental Awareness helps students conceive the environment in its totality. 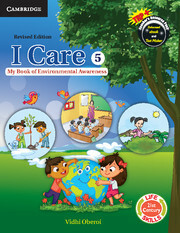 I Care: My Book of Environmental Awareness helps young learners conceive the environment in its totality and become aware of the current environmental issues. Built on the guiding principle 'I do, I understand', the series equips every child to apply the knowledge and values acquired to one's life. Exploratory and hands-on activities, discussions, opinions and experiments make learning interactive and interesting. With this in mind the Teachers’ Notes provide teaching tips and suggestions for teachers. The content is divided into thematic units starting from the child, his/her family, then the community and beyond. Wrap up in the form of graphic organisers are given at the end each chapter for quick recapitulation. Things you know has pen-and-paper based assessments carefully graded according to Bloom's taxonomy. Get busy are individual or group activities to test the ideas grasped of the topics discussed. Things to do are revision exercises in the form of fun projects/ games/ experiments to reinforce the concepts covered in the chapters. Environment Connect at the end of each chapter are current and relevant examples of and hands-on activities on sustainable practices and interesting facts about exceptional people, organisations, countries who have positively impacted the environment and set new trends and blazed a trail, thus connecting theory to real life. 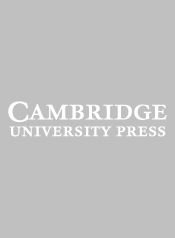 Teachers' Manual with additional teaching and testing material. On-line teacher support material at www.cambridgeindia.org.